WILMINGTON, Del. 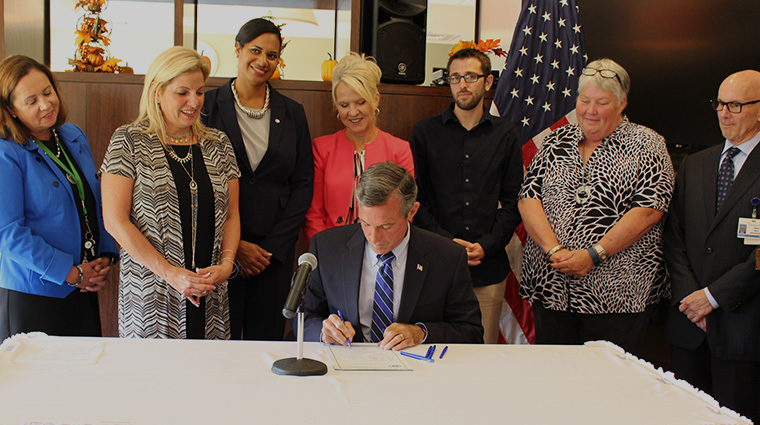 – Governor John Carney on Thursday signed House Joint Resolution 7 granting authority to the Department of Health and Social Services (DHSS) to establish a health care spending benchmark for Delaware with a growth rate linked to the overall economy of the state. The signing ceremony comes less than three months after a federal analysis found Delaware had the third-highest per capita level of health spending of all the states. House Joint Resolution 7, Gov. Carney signs HJR 7.sponsored by House Majority Leader Valerie Longhurst and Democratic leadership, and supported by both parties, authorizes DHSS Secretary Dr. Kara Odom Walker to establish the benchmark as a way to evaluate the total cost of care of health care in the state. The benchmark also will serve as a major step in transforming Delaware’s health care system to a more outcome-driven system and away from a system that pays for care based solely on the number of room days, visits, procedures and tests. Co-sponsors of the resolution included Speaker Pete Schwartzkopf and Rep. John Viola, and Senate President Pro Tem David McBride and Sens. Margaret Rose Henry and Nicole Poore. Delaware’s per capita health care costs are more than 27 percent above the U.S. average, ranking the state third-highest in the country, behind only Alaska and Massachusetts, according to spending data released in June by the Centers for Medicare and Medicaid Services (CMS). The CMS analysis of all insurance payers – Medicare, Medicaid and private – found that per capita spending in Delaware for 2014 was $10,254, compared to the U.S. average of $8,045. Without changes, the analysis estimates that Delaware’s total health care spending will more than double from $9.5 billion in 2014 to $21.5 billion in 2025.